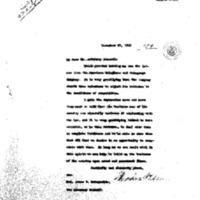 Woodrow Wilson writes to James C. McReynolds about a letter he received from the American Telephone and Telegraph Company. Thank you for letting me see the letter from the American Telephone and Telegraph Company. It is very gratifying that the company should thus volunteer to adjust the business to the conditions of competition. I gain the impression more and more from week to week that the business men of the country are sincerely desirous of conforming with the law, and it is very gratifying indeed to have occasion, as in this instance, to deal with them in complete frankness and to be able to show them that all that we desire is an opportunity to cooperate with them. So long as we are dealt with in this spirit we can help to build up the business if the country upon sound and permanent lines. Wilson, Woodrow, 1856-1924, “Woodrow Wilson to James Clark McReynolds,” 1913 December 19, WWP18229, First Year Wilson Papers, Woodrow Wilson Presidential Library & Museum, Staunton, Virginia.